The Palais Galliera, in close collaboration with Alber Elbaz, artistic director of Lanvin, is honouring the oldest French fashion house still in business. This first Paris exhibition devoted to Jeanne Lanvin (1867-1946) features over a hundred models from the amazing collections of the Palais Galliera and the Lanvin Heritage. Mademoiselle Jeanne began her career as a milliner in 1885. In 1889, she opened a shop “Lanvin (Melle Jeanne) Modes” at 16 Rue Boissy d’Anglas, then in 1893 acquired her premises at 22 Rue du Faubourg-Saint-Honoré. In 1897, she gave birth to her only daughter, Marguerite, who became her primary source of inspiration. In 1908, Jeanne Lanvin hit upon the new idea of children’s clothes. The following year, she opened the Young Ladies’ and Women’s department. That same year, she joined the Syndicat de la Couture, the designers’ union, and entered the closed world of French Fashion Houses. There followed a brides’ department, departments for lingerie and furs and, in the early 1920s, interior decoration and sport. In 1926, the entrepreneurial designer launched into men’s fashion. She also opened shops in Deauville, Biarritz, Barcelona, Buenos-Aires, Cannes, and Le Touquet… Inspired by the intense blue in frescoes by Fra Angelico, that same quattrocento blue became her favourite colour… In 1927, she celebrated her daughter Marguerite’s thirtieth birthday with the creation of the legendary perfume Arpège. The famous logo designed by Paul Iribe, depicting the couturière with Marguerite, is displayed on the round bottle created by Armand Rateau. The same logo is still featured on Lanvin creations to this day. Jeanne Lanvin used travel diaries, swatches of ethnic fabrics and a vast library of art books to feed her curiosity and inspire her to create fabrics, patterns and exclusive colours. Jeanne Lanvin represents artistry in materials, embroidery, topstitches, twists, spirals, cut-outs – all the virtuosity of the couturière’s craft. It is classical French perfection, with very 18th century style dresses – slender bust, low waist, ample skirt – contrasting with the tubular line of Art Deco with its black and white geometrical patterns, the profusion of ribbons, cristals, beads, and silk tassels. A capacity for hard work and an intuitive understanding of the modern world only partly explain the extraordinary success of this discreet woman. Alber Elbaz and the Palais Galliera invite you to an encounter with this great lady of haute couture, Jeanne Lanvin. 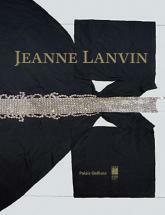 The 'Jeanne Lanvin' app is available in english for free on Apple Store & Play Store. To learn more on the app, click here.